A lack of technological unity can have a profound effect on an organization’s ability to function. Keeping key business elements in silos creates friction points and blind spots that affect an organization’s performance at every level. 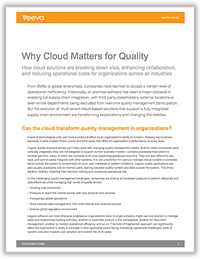 Legacy quality solutions simply can’t keep pace with changing quality management needs.